In relation to this post by Insanity now, serenity later. 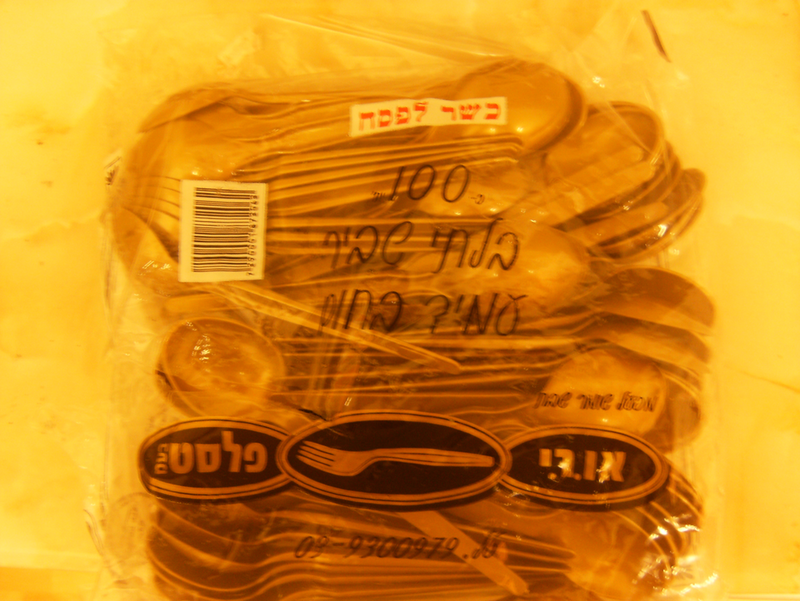 While getting out a spoon just now I noticed that my plastic spoons are also kosher for pesach. Good to know. Name: (English first name) (English second name) (Non-Jewish last name). Not quite Chaim Modche Brecher. Yichus: Parents are balei teshuvos. I’m 3rd or 4th cousins with Billy Joel. Also, I was named after a famous actor. Direct descendant of Adam HaRishon. Parents looking for: Something female. I think they’re getting hysterical. Dating History: Inadvertently launched Gisele Bündchen’s modeling career by telling her she “waddled”. She launched a runway career just to spite me. Photo: Only eyes and hair currently available. Post-Yeshiva: College. The only Jew on campus. 1998-2003: Packed latex gloves, watched meat, fixed computers. 2005-2006: Fixed computers at a Circuit City. 2006- : Filed law cases, stocked shelves, unloaded vans. Mother’s use of Sabbath Mode oven: They have that these days? Use of a community Eruv: Just to annoy the people who don’t hold by it. Indian Hair Sheitels: Depends. Do they come with an Indian? Also, American Indian or Indian Indian? Seat Belt Use: Live fast, die young. Shabbos Table: Plastic everything. Convenience is king. Would be willing to live in: Certain parts of New York. Specifically one of those Manhattan Penthouses. Ideal Chesed Opportunities:Helping ex-members of Miami Boys Choir get real jobs. Before I get to the heimishness of the post I’d like to apologize to the people who apparently check in each day for the lack of posts. Even with no new posts for over a week I got roughly the same amount of hits each day. Occasionally I disappear for a while to do some contract work for an agency known only as ‘The Agency’. Snappy name, eh? I can’t say what we do, but Vladmir Putin is the head of Human Resources. Anyways, onto the post. I also heard of families being described as heimish. This is where I learned that heimish apparently just means ‘homely’. Safe enough, but in last weeks Mishpacha in one of the stories (might have been in Family First actually. Yes, I read it.) described a meeting as having a variety of families show up “everything from yeshivish to heimish”. From this I infer that heimish and yeshivish are opposite ends of a spectrum and I guess that means heimish is the opposite of yeshivish? But most families I know who are described as heimish tend to also be yeshivish. I’m not sure what the opposite of yeshivish is anyway. It’s either Modern Orthodox Liberal (thank you frumster) or a private Catholic school. To add to my confusion, you can hire a heimish cab driver, buy heimish electronics, eat heimish food, cholent can be particularly heimish I’ve found. So does heimish simply mean ‘good’? But there’s too many other yiddish style words for good that are more fun to say, my favorite being ‘moiradik’. That’s another word I don’t know the meaning of beyond the fact it’s generally used to infer something is positive, in the single time I’ve actually heard it used, it was a bagel with cream cheese. I’m not sure if the bagel or the cream cheese were specifically moiradik, or if it was just the combination that raised its essence to moiradik. Safe to say it was probably some very heimish cream cheese. So if heimish is just another yiddishism for something positive, why did heimish merit to be used in such a wide variety of contexts? Noones ever advertised as being a moiradik cab driver. The single unifying point I can make for heimish is that if a person is heimish they’ll generally have a long beard, hence my original thesis that heimish is just beard hair. Hopefully it’s not actually in my challah. That would just be too heimish for me. I’m not generally one to push films on other people, but I saw ‘In Bruges’ yesterday and it’s one of the best movies I’ve ever seen. The trailer makes it look like an over-the-top action movie but it really isn’t. It’s got a great story, good character development, amazing piano soundtrack and is also quite funny. More funny with the wordplay than any sort of slapstick though. Not for kids. It’s got violence and lots of cursing, though little to no sexual content, so therefore it’s perfect for yeshiva guys. Oh, and those of you with bleeding heart disease beware; it takes quite a few potshots at stereotypical American tourists in Europe, so if you’ll get offended at a fat American family being told they probably shouldn’t try and climb the tower, stay away. Anyway, it’s a great black comedy. Why Are You Arresting Her? I’m The One Who’s Jewish! Australian Aboriginals are the native ethnic group of Australia. They don’t look white or Jewish. This one has a very interesting ending. I sat here for about five minutes with nothing written trying to think of a good title. It doesn’t help that I’m unable to think clearly due to being tired yet unable to sleep after sleeping two yom tov afternoons in a row. Even sleeping shabbos afternoons usually messes me up until Monday. So I accept this lame title as a byproduct of a mind functioning at less than optimal capacity. First up, thanks very much to everyone who gave advice on my car rental dilemma, especially Jacob Da Jew who went beyond the call of duty. It’s situations like this that give me a real sense of achdus among Jews. Looks like renting outside of New York is the way to go. I need to sort out some logistics, but the price has become far more doable. I knew about the Chabad corporate thing already, but I’m not sure if it’s really right to use it. My closest affiliation to Chabad is from davening there sometimes, and playing in a band called 7Seventy. Speaking of, I’m in the process of starting a new one. If we ever make it, look for an album by ‘The Usually Excellent’. At the very least it’s a good summer time-filler. Recently, I realized that one of my brothers friends, a devoted atheist, is the son of a prominent kiruv rabbi. This had me pondering the question of whether or not you should be able to teach something if you weren’t able to even teach it to your own children? I mean we’re talking about a rabbi who’s renowned for his ability to show people that G-D exists and the torah is true, but he couldn’t pass that along to his own children. It seems that it’s the children of therapists and professions like that who have the most messed up kids. My exhibit A is the son of famous radio therapist, Dr Laura Schlesinger, a woman whos voice is forever drilled into my head along with her catchphrase (“…Call 1800-D-R-L-A-U-R-A…”) because my mom listened to her show religiously, no matter how much I would try to point out that she doesn’t say anything besides the obvious, never mind the idea of people taking advice on fixing their lives and relationships from a two minute radio chat with a celebrity. Lastly, this post from Material Maidel. (Incidentally, ‘maidel’ is one of the words I never heard of before I started reading blogs written by New York Jews.) I don’t understand the mentality of relaxing kosher standards when you’re on holiday. If you normally would only eat things with a hechsher, it’s beyond me how you’d eat fish at a non-kosher restaurant when you’re on holiday. Does that mean you normally wouldn’t eat non-kosher only because you’re afraid of being seen by someone you know? Oh, and the green hair to the right? It’s a photoshop. Dying my hair is one of the few things I want to do but won’t due to society and familial constraints. Also, they told me in high school that it was considered ‘davar ish’ (a womans thing). Not to mention they would have expelled me. At least computer trickery lets me see what I would look like. So one of my friends from high school is getting married end of August in Chicago. I’m using his wedding as an excuse to have an end of summer northern holiday. I’m flying into JFK, my initial plans were to rent a car, spend a few days seeing the sights and hopefully catch up with some people from my beis medrash days, then drive to Chicago for shabbos, the weddings on Sunday, so leave Tuesday after seeing a bit of Chicago, then I had a vague idea to drive east to see some people in Virginia and Maryland. Plans sort of hit a bump when I paid a visit to Enterprise and saw that three weeks of car rental even at the economy class would cost around $900 and I assume that doesn’t even include insurance. So are there better car rental places where I could get something for around $100 a week at most? Is there maybe even some sort of hemishe car rental where I can get a yeshivish banger for next to nothing? It’s New York, I assume you have everything. My brother suggested I take trains from city to city. How feasible is this and how much am I looking at? And I haven’t even started wondering where exactly I’ll stay yet. Help me out New York Jews.